If you are nocturnal like me, you’ll grab a flashlight to see what the corals are doing in darkness. 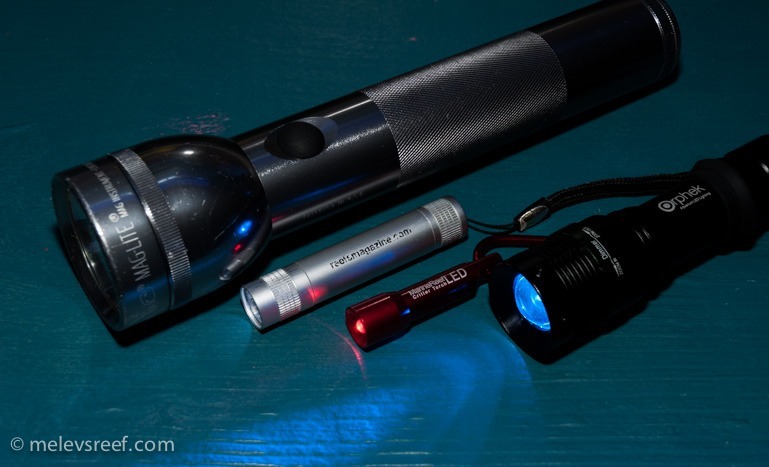 I’ve used a few different flashlights over the years, but by far my favorite is the all blue one that Frag Junky / Orphek released at MACNA last year. 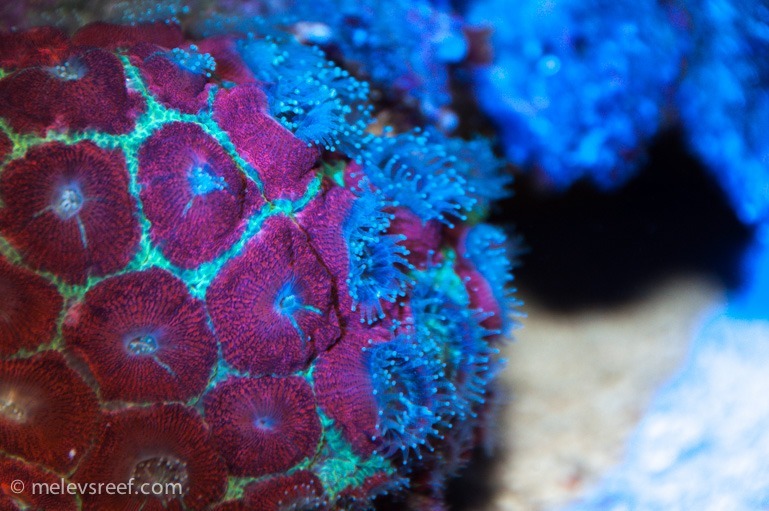 It’s so incredibly bright blue that corals pop with color. I ran up on the 60g a few nights ago and clicked on that light, and I swear a Peppermint Shrimp molted in fear. It darked out of sight when hit by the blue beam, and a molt was left in its wake. Could be coincidence, but I like to think I made it happen. Here’s what the War Coral looks like at night. Each polyp opens up like a small hand and moves in the current, hoping to snare some drifting food. This Acan was fully open, and I enjoyed the view for 20 seconds. Later when I returned to that spot with the camera, most of the polyps were closed. 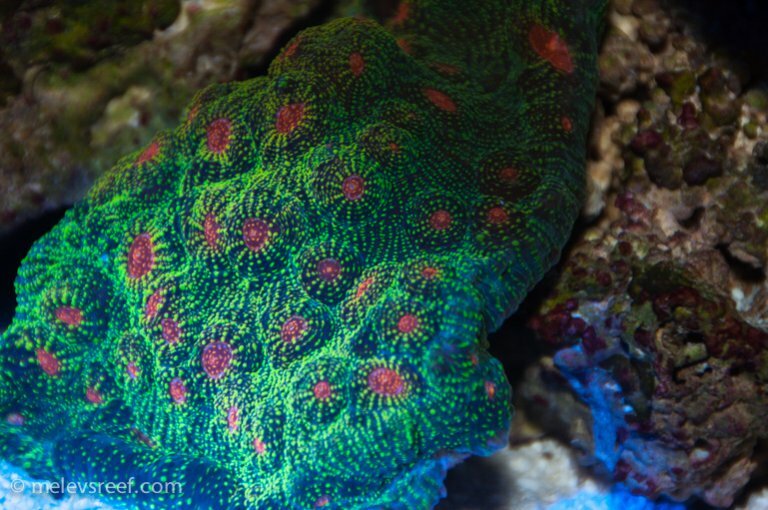 Guess the light triggered the coral’s protective-mode and it closed up many of the polyps. I’ll try again some other night, and maybe shoot video instead. Some of the chalices extend sweeper tentacles, but this one just glowed vividly. 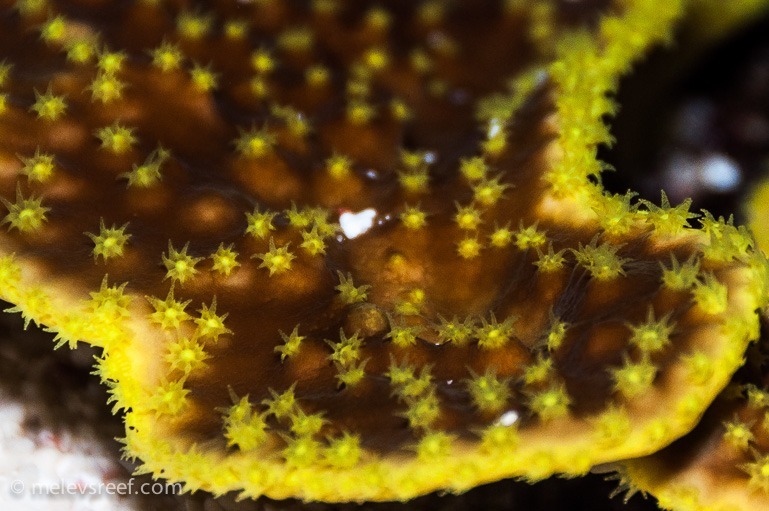 The yellow scroll coral adds some nice design to the tank with its glowing yellow leading edges and polka dotted body, but at night it transforms into a bunch of yellow stars. In tomorrow’s blog, I’ll focus on this one coral specifically. 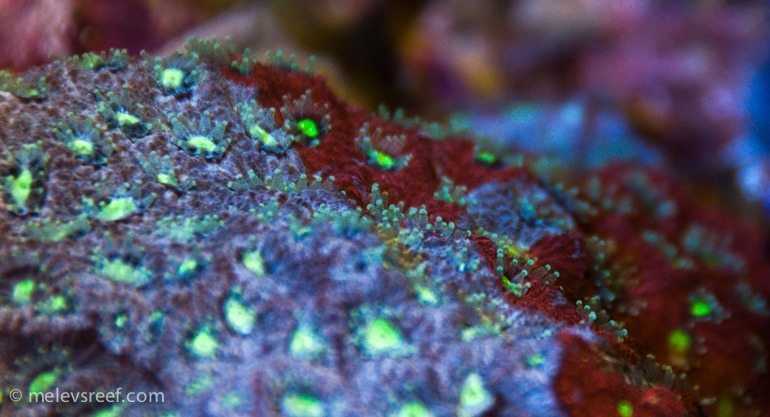 If you want to see what’s going on in your tank late at night, make sure those moonlights are off and the tank has been dark for a couple of hours, then go on a flashlight expedition. Odds are you’ll have a great time and want to do so more often.